Exhibit D: Did I mention it’s winter? 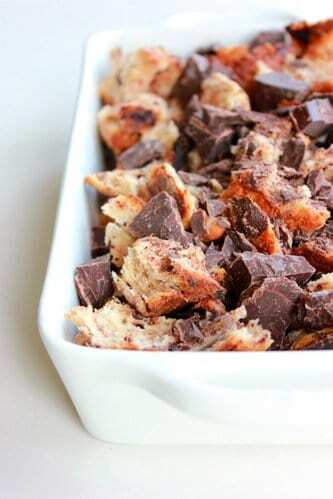 Though bread pudding is usually the solution to the problem of stale, leftover bread, I’d argue that this particular bread pudding should be the cause to bake a batch of Chocolate Things, rather than merely a happy effect. 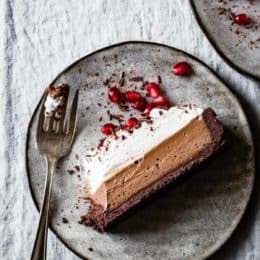 Thus any erstwhile chocolate things that escape your hungry maw within the first day or two of baking, which is when they are best, should be torn up and put in a baking dish. Sprinkle them with more chocolate chunks. Soak them with a boozy, crème fraîche custard. Wait for an agonizing half-hour while your home fills with a scent that makes you want to eat your own hand, i.e., yeasty butter and chocolate heating in the oven. A sprinkle of coarse sugar and toasty bread create a crunchy crust. 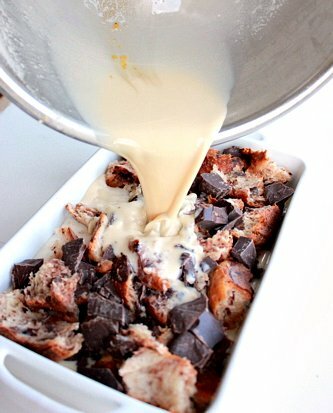 Break through it and delve into soft custard oozing with pockets of melted chocolate chunks. A top note of tart bourbon paves the way to the bittersweet bite of deeply dark chocolate, while the mild tang ofcrème fraîche keeps things lively. 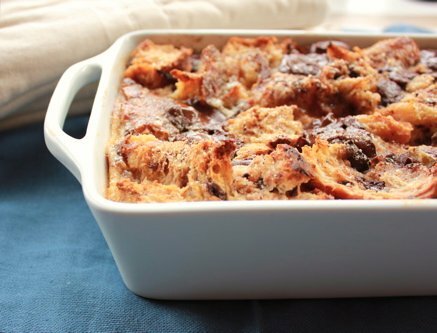 The texture of this dessert is similar to a croissant bread pudding, due to the slightly flaky nature of the chocolate things, whose dough contains ample amounts of butter, buttermilk and heavy cream. 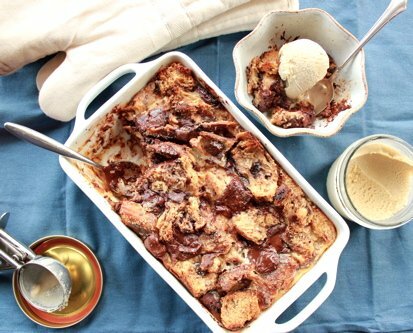 But if you are without chocolate things and need to put chocolate bourbon bread pudding in your face NOW (and you don’t live in Berkeley near The Cheese Board), you can try using store-bought chocolate croissants, or a soft white bread, such as brioche or challah, topped with extra chocolate. 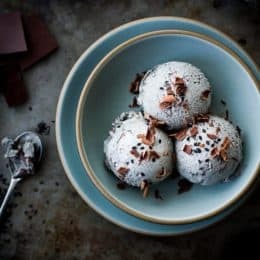 If you do bake your own chocolate things, an added bonus is that you’ll also have the ingredients to makecrème fraîche – cream thickened with the help of buttermilk and a bit of time – which is vastly cheaper than buying the stuff pre-made. 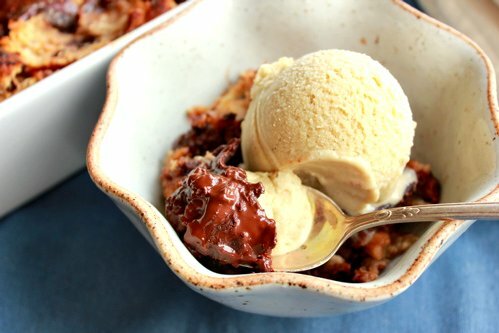 And if you need further reason to bake up a batch of chocolate things, well, you can top a dish of warm, gooey pudding with a scoop of Irish Coffee Ice Cream. 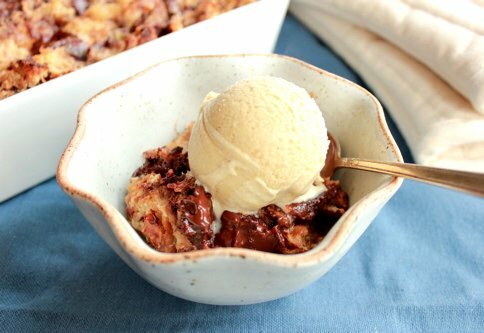 I made this pudding from leftover Chocolate Things, but if you lack them (and don’t have 4 hours to spend baking them or live near The Cheese Board), you can try using chocolate croissants instead, or substitute 8 ounces of buttery white bread (like brioche or challah) and double the amount of chocolate. 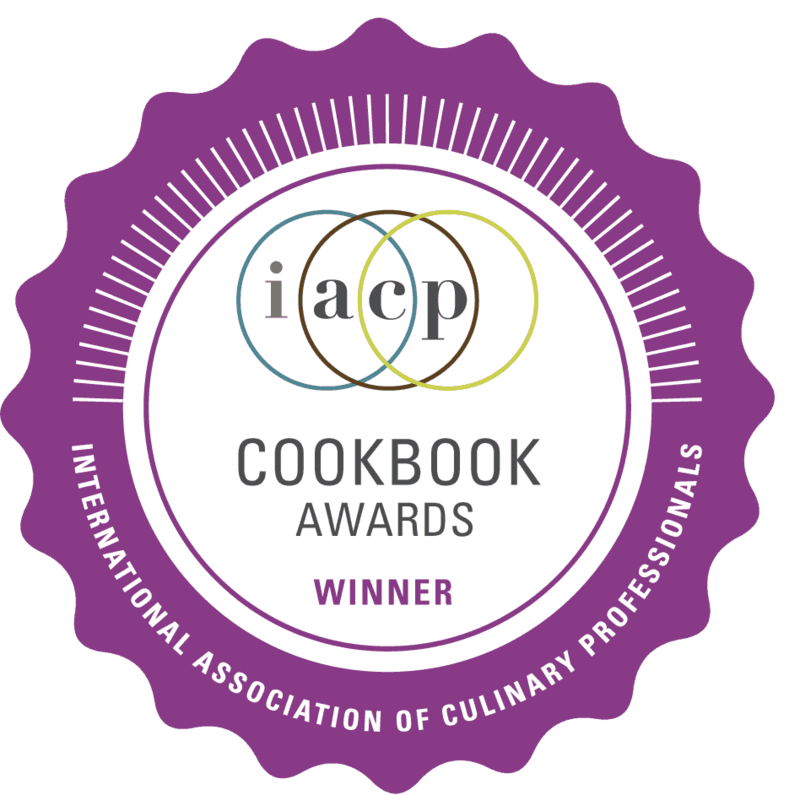 Though the chocolate things take a bit of time to rise and bake, the actual pudding comes together in minutes. If you do make chocolate things, you’ll also have ingredients left over to make crème fraîche: buttermilk and heavy cream. Simply stir 1 tablespoon of buttermilk into 1 cup of heavy cream. Cover and let sit in a warm-ish spot (like on top of the fridge) for 24 hours, until thickened, giving it a stir once or twice during that time. As for the chocolate things, I used Scarffen Berger’s bittersweet (70% cacao mass) chocolate for the chunks. I used a super cute baking dish that I picked up from Crate and Barrel, which measures 9x6x2.25″ tall. 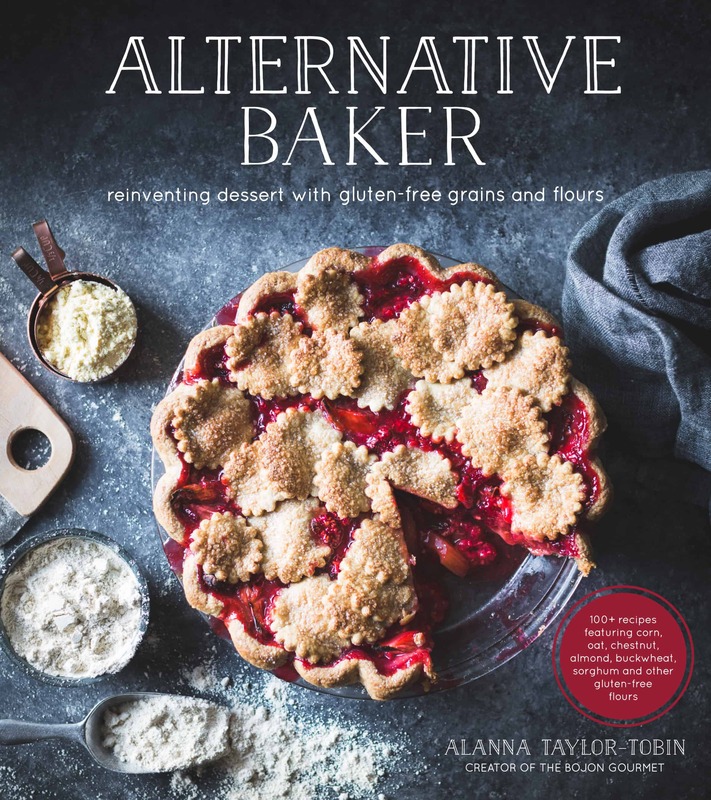 I’d wager you could use a loaf pan, pie pan or small gratin dish instead. Or bake the puddings in 6 individual ramekins.The pudding stands on its own, but you can top it with caramel sauce, whipped cream and/orIrish Coffee Ice Cream. Position a rack in the center of the oven and preheat to 325º. Place the broken chocolate things in a baking dish (see headnote) – they should come almost to the top of the pan. 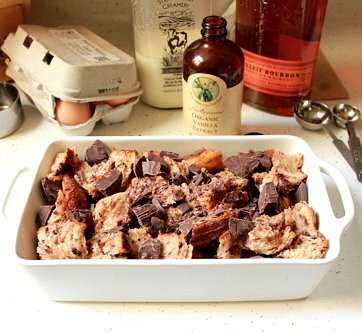 Scatter the chocolate chunks over the top. In a large bowl, whisk together the eggs, brown sugar and salt until combined. Whisk in the bourbon and vanilla, then slowly add thecrème fraîche and whole milk. 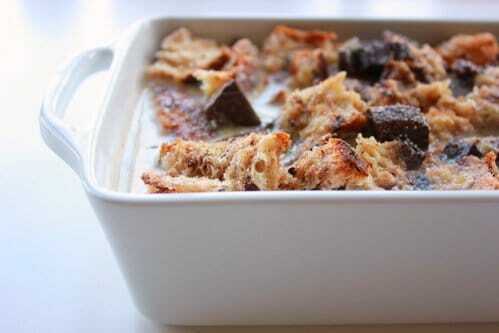 Pour the custard over the bread and chocolate (it should almost cover the bread), and sprinkle with the coarse sugar. 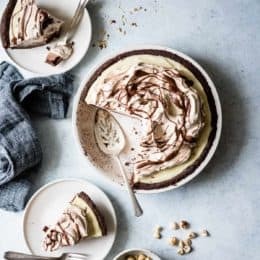 Bake the pudding until puffed, golden on top, and when you peek into the center with a sharp knife, there is no watery filling, 35-40 minutes. Let cool for at least 10 minutes. 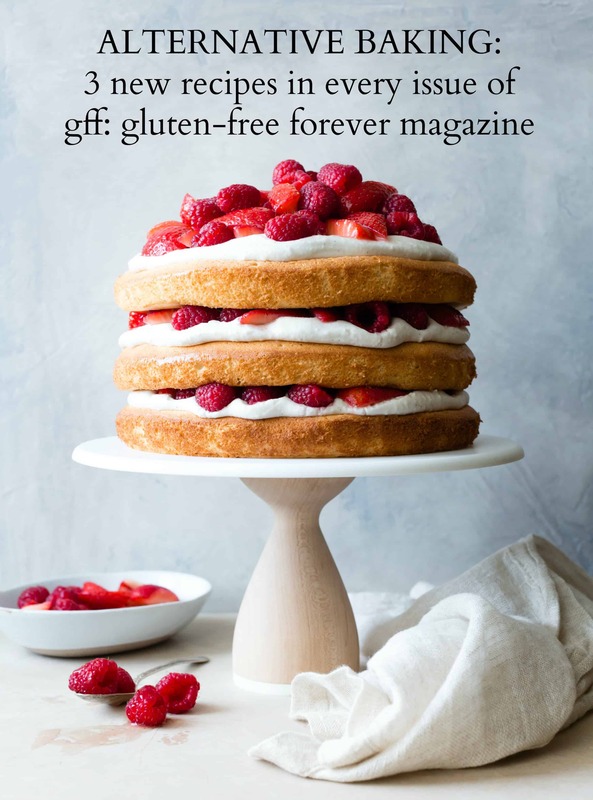 Serve warm, with or without other decadent toppings. Leftovers can be stored in the fridge, and reheated in a 300º oven for about 10 minutes.